To be the premier construction partner of choice for the commercial construction industry. Our customers depend on our communication, professionalism and pride in workmanship. They understand it is our mission to build a long-term relationship they can consistently depend on. Our trade partners know they will be respected as an important element to our success. This is only possible through providing a family-centered culture for our employees that focuses on compassion, integrity and trust for each other. 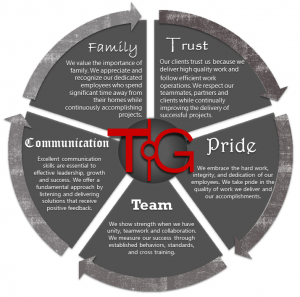 TGC is a family-owned company committed to being the contractor of choice. We are dedicated to the development of a long-term client relationship where our customers know they can trust us to complete their projects with the highest level of quality and integrity. We will strive to accomplish this by developing strong and collaborative relationships with our trade partners and providing our employees with a team-focused experience throughout their career.